crafty goodies: Avocado Arts ~ Spring Medley 3rd project!!! Hi guys~I wanted to share with you my last project for the March release of "Spring Medley". 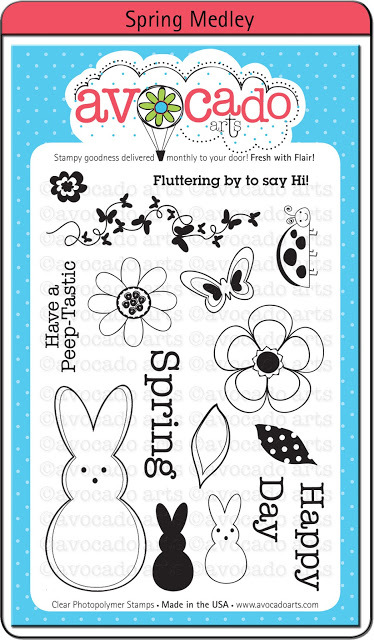 This set is full of Spring images and can be used along other Avocado Arts stamp sets. I love making embellishments with the stamps , cutting them out, an adding foam dots to give them an extra pop!!! You can go HERE to see this set along with all the other cute sets in the store. See ya in a couple weeks with the April release~it's a good one too!!! For more inspiration check out the Avocado Art's "Pit Crew"
Love love love love love this!! LOVING the photos, the colors and loveeeeeeeeee the peeps bunnies!!! love what you did with this! Adorable!! Love those adorable little peeps! This is Peep-tastic!! Love this layout!! That is soooo adorable . I love peeps. What a cool way to showcase it. Love the ruler too. I'll be copycatting that one. ooo AND YOU'RE ON SHIMELLE'S BLOG. WOO HOO CONGRATS!!! wow GREAT LAYOUT... love those fun family pictures..
Super sweet page, Connie! 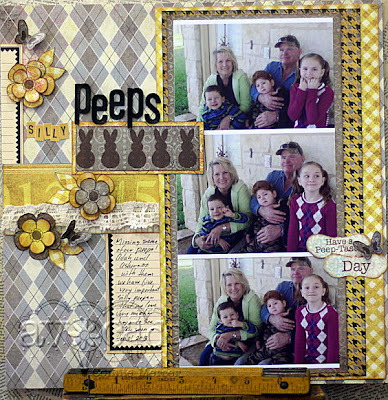 Love the bunnies and title with these wonderful family pics! Oh this is adorable, I love the brown bunnies! SO fun! Wonderful multi-photo layout. I am loving the yellow and the fun stamped peeps. 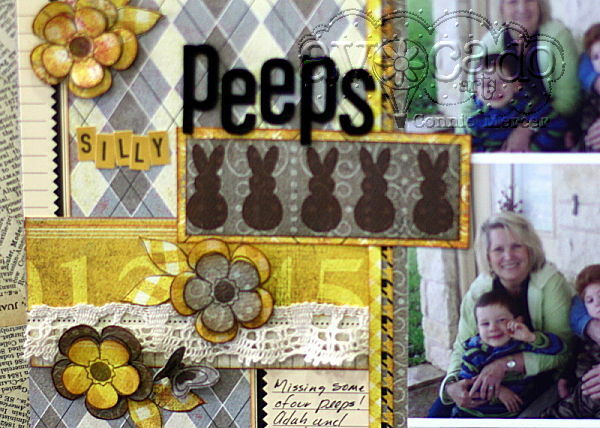 LOVE how you used the stamps on your layout...those chocolate bunnies are adorable! Amazing! Love the texture. Love the technique. Love the layout! Thanks for sharing the ideas! !